The good people at the American Association of Independent Music, better known as A2IM, announced the nominees for the annual Libera Awards this week. The ceremony takes place on June 21st, celebrating acts and labels of all sizes in indie music. Among the many fantastic nominees are several from The Orchard family. 2018 has been quite a whirlwind of a year already for Run The Jewels. Following their 2017 release RTJ3, the duo took the crown as ambassadors of Record Store Day, released a remix and will be touring with pop sensation Lorde, and now, they’ve earned a spot on the Libera Awards ballot. El-P and Killer Mike earned nominations for both Best Sync Usage for EA’s FIFA ’18 Official trailer starring Cristiano Ronaldo and Marketing Genius for their ‘Call Ticketron!’ campaign. Triple Crown Records are back-to-back nominees for the Label of the Year (Small) Award. Home to a number of rock and pop-punk favorites such as Foxing, Into It Over It, Tiny Moving Parts and more, Triple Crown is the defending champion of this award after winning it in 2017. We’re rooting for a repeat! Nacional Records also raked in three nominations including two releases up for Best Latin Album with Él Mató A Un Policía Motorizado’s La Síntesis O’Konor and La Vida Boheme’s La Lucha. Forró In The Dark marks the third with Sandcastle, up for Best World Album. 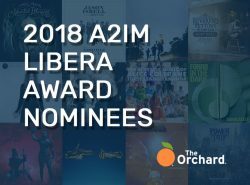 See the full list of nominees on the 2018 Libera Awards site and take a look at The Orchard’s wide variety of nominated labels below. Congratulations to all those nominated, we’ll see you June 21st at the Playstation Theater!